The Reports feature lets you generate an Excel Report of the submissions and share it with others. 5. 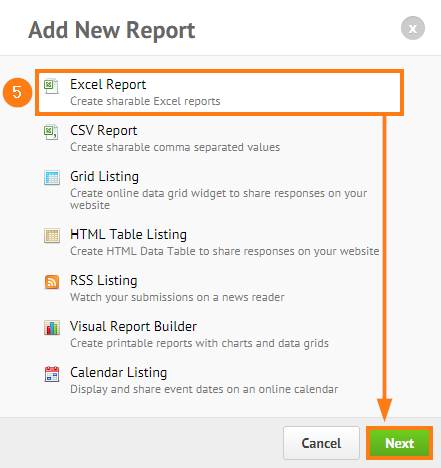 On the modal popup, choose EXCEL REPORT then click NEXT. 7. 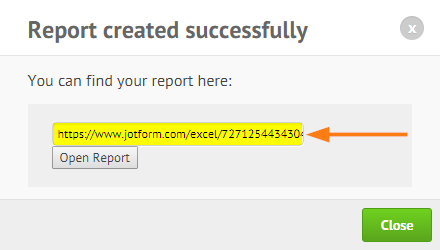 Copy the generated EXCEL REPORT URL then click CLOSE when you're done. Will the excel spreadsheet update automatically as new submissions come in? my first jotform send reports as a spreadsheet to Google drive. My second form Jotform is sending the reports as pdf docs to google drive. Can't find where to correct my error. A couple of people have submitted their forms but the forms have not appeard on the XL report. As the system will only allow one go at registering is there any way of adding them manually to the report. Also I have deleted one submission in error, can it be re-established? Bueno dias. Desde mi cuenta no puedo realizar un Informe con excel. queda leyendo como colgado. Si puedo hacer informe en PDF. pero necesito en Excel. Por favor necesito con urgencia tener el archivo .xls con todos los datos y también los gráficos correspondientes. 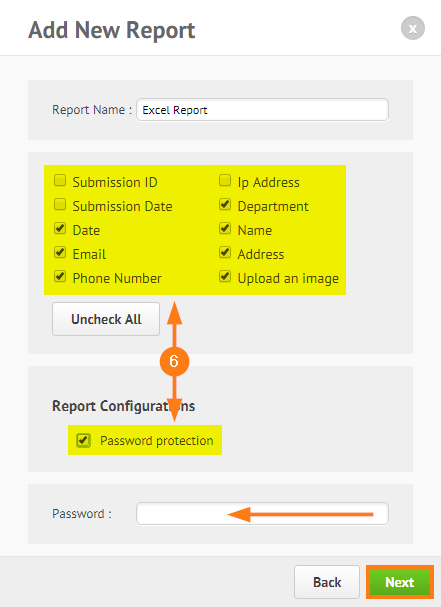 Report creating in exel is very nice feature. How i can filter the dates for a excel report or a specific criteria before generated, for example i want to give the url a some customer but he only must see your own information. Is it possible to change the name of the excel sheet ('Submissions') into another one? When will you replace the manual process by an automatic data flow, as already exists for Google sheets? I have multiple forms. Part of the filled in items are everytime the same (name, email, stuff like that). Can I change the order in the Excel reporting? For instance: I have 8 forms with different questions on each, but all have somewhere in the form a question about name and email. I want to generate excel reports for all 8 forms that I start everytime with the recurring data (name, email etc). Is there a way to format the Excel report so that columns are either left justified, or some are centered? Can I link this excel report to update automatically to my excel online account / MS sharepoint account - so that it shows latest data of all in one place so that I can share it? If my form is encrypted how do I un-encrypt the report. I keep getting code in my excel report. Is there a way to create an Excel report that is a consolidation of submissions from multiple forms? I am trying to download and excel report; however it limits me to 10,000 occurrences. How do I expand it so that I can get all of the data on one report? I'm looking at running a report that is a summary of all the data for each questionnaire. How do I do that? Is there a way to create a report of only new submissions, i.e. those that were not pulled out in previous versions? It would be great if we could add a deliminiator for multiple select items to the excel report. We are currently running a Homecoming event with many single events held within it. http://www.jotformpro.com/form/41793566198975. Currently, it is dumping all the individual event information under one column of cells called "Events: Products. This means we have to look by hand to see which events the customer is signed up for and how many are attending each event. I need this information to be listed separately by each event and number attanding each event. Can this be done? In my form http://form.jotform.com/form/20425050478 in the last item: the report includes payee info and payee address all in the last DInner Cost column. How do I get it to separate payee info and payee address into their own columns in xl sheet? Having it all in one column adds many keystrokes to get it to a workable size. Do like your app! Is this link that is being generated constantly updated with new submissions? Or is it only capturing current submissions before the final step of the wizard report? I mean the field names that can be inserted when generating email. How can I get the short column names (fieldname) in the Excel Report?